I'm feeling a bit better than I did yesterday so, having been woken by the very small amount of rain at 4:45am, I'll have a go at another World War One Soldier's Story to get back up to blogging speed. I have done a few of these now all of which can be accessed from the list on the World War Soldier's Stories tab at the top of this page. This post has also been labelled Tombstone Tuesday, which is a Geneabloggers prompt. More Tombstone Tuesday stories from around the world can be found here. Choosing to write this particular story was prompted by an email from a distant family connection who is, rather less distantly, connected to John Thomas Johnson. I wrote a version of this story some time ago and it was published in the October 2010 edition of the Barnsley Family History Society. Several summers ago, my first dabble into recording gravestones was as part of the Barnsley Family History Society's project to transcribe the stones in Monk Bretton Cemetery. A CD or DVD was planned containing images of the stones and all the transcriptions - so far only part one has been produced which covers the churchyard and any memorials in the church itself. It struck me unlikely that John Thomas Johnson was buried in the plot, but rather that this inscription was added to give the family somewhere local to remember him. When I got home that afternoon I checked the Commonwealth War Graves Commission website and soon found the entry for John Thomas who was actually buried in Lijssenthoek Military Cemetery in Belgium, about 12km west of Ypres. 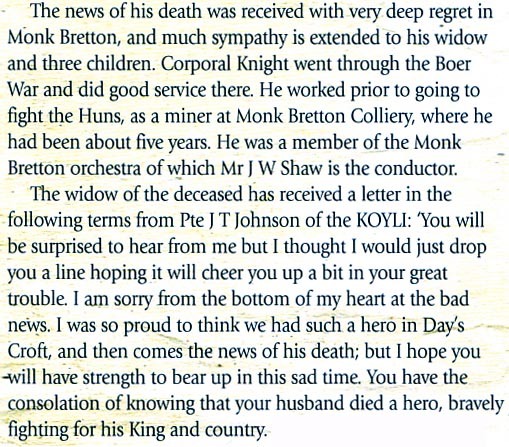 The entry confirmed that his parents were George and Ann Johnson and gave an address of 11 Day’s Croft, Monk Bretton. It was also confirmed that John Thomas had served with the 8th Battalion of the King’s Own Yorkshire Light Infantry, but I also noticed that he had the letters MM, standing for Military Medal in the Awards section of the entry. I was able to find John Thomas’s medal card on the Ancestry website. 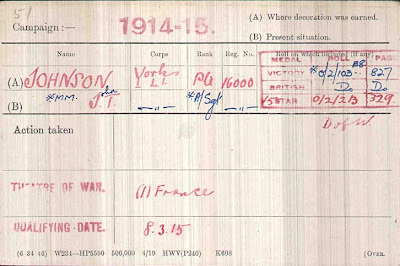 He was listed as a Private on the CWGC site but this card stated that he was later an Acting Sergeant. 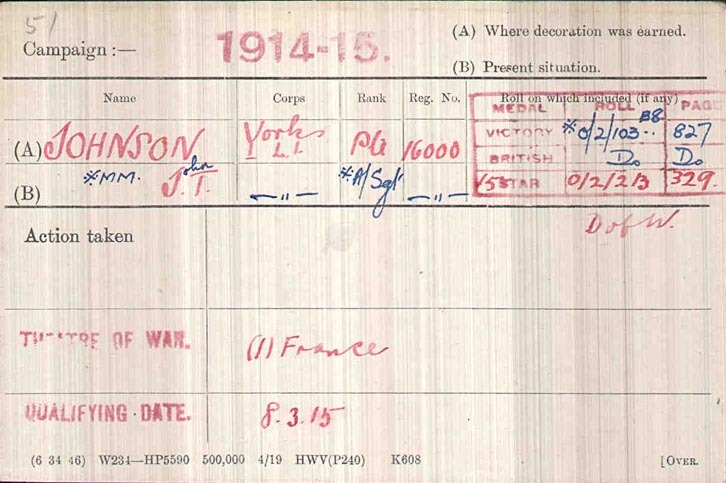 It confirmed his Military Medal and it was also recorded that he qualified for the 1915 star and the Victory Medal. A general search on Google brought up the information that John Thomas was listed in De Ruvigny’s Roll of Honour, which can be accessed via Ancestry and Find My Past. This entry gave me a picture of John Thomas (who looks very young) and a short obituary. He was awarded his Military Medal for gallant and distinguished service in the field on 1 July 1916, the first day of the Somme. This item confirms that John Thomas was the youngest son of George Johnson of 11 Day's Croft, Monk Bretton by his wife Ann, with the added detail that Ann's father was James Kitchen. 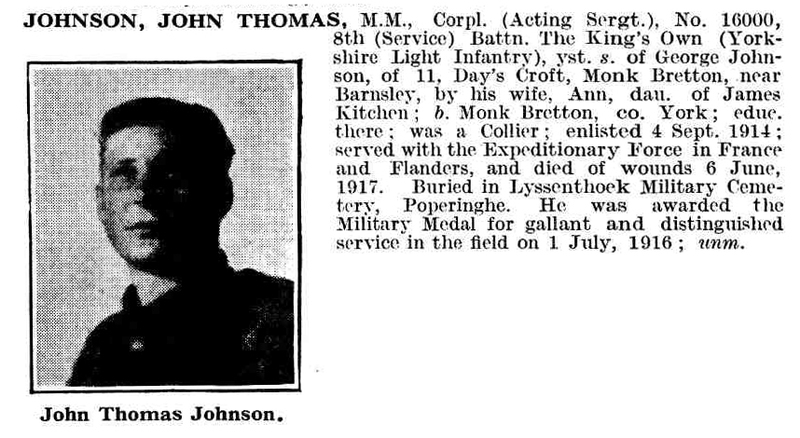 John Thomas was born in Monk Bretton at the beginning of 1895. His family lived in 4 Garrison Houses in 1891 and 11 Day’s Croft in 1901 so I am not certain precisely where he was born. He had four brothers and four sisters. They must have been quite crowded in 1911 as John Thomas’s married sister is living with her parents at 11 Day’s Croft along with her husband and two children, a total of ten people in five rooms. At the time of this census, John Thomas is sixteen years old and a Pony Driver in a coal mine. His mother Ann died seven days after the census was taken and is the first of the family in the plot at Monk Bretton. I must confess that since writing this article nearly three years ago my references have failed ... I quoted a piece from the Great War Forum for the following movements of the 8th (Service) Battalion of the King's Own Light Infantry, commonly known as the KOYLI, but on checking it this morning it is a dead link. However there is lots and lots of information about the KOYLI on the forum, you do need to register to search it, but Google searches often provide random hits without registering. 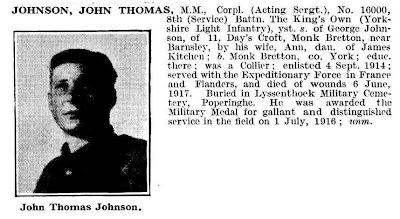 According to his obituary, John Thomas enlisted on 4th September 1914. He would have been just nineteen. His battalion was formed in Pontefract in September then moved to Aldershot in December, by August 1915 they were in France. 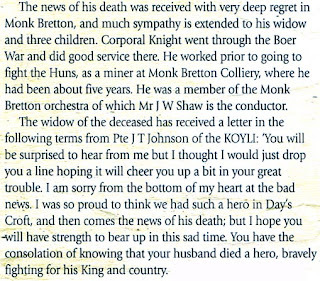 John Thomas' letter goes on to express the general feeling of the time, that men who did not sign up to fight were slackers, note that he comments that dying fighting for King and Country was a noble and heroic action. We have to remember that the war had only begun just over one year previously, conscription was yet to come and most people expected it would be over very soon. After events of the following summer the attitudes of the soldiers and the people back home began to change. On 1st July 1916 the 8th KOYLI attacked the Authuille Wood, 5km north of Albert. As the waves of soldiers crossed No Man’s Land they lost 50% of their number, including all officers. There was close quarter fighting in the German second and third lines and some NCOs were later reported to have led renewed attacks. Only 110 men survived of the 659 who had gone into action. This was the day when John Thomas earned his Military Medal. He was mentioned in the London Gazette Supplement on 1st September 1916. His Majesty the King has been graciously pleased to award the Military Medal for bravery in the field to the under mentioned […] non-commissioned Officers and Men. 16000 L/C J.T. Johnson. Yorks L.I. His battalion continued to fight on the Somme until the middle of October when they were transferred to the Ypres sector. The village of Lijssenthoek was close to the front line at Ypres but out of range of the German artillery, so it was used as a casualty clearing station. The cemetery there is the second largest Commonwealth cemetery in Belgium. We can only assume that John Thomas was carried back here from wherever he was wounded before he died on 6th June 1917. This date fits with the build up to the Battle of Messines. Artillery bombardments had started on 31 May 1917 with the first attack taking place on 7th June, the day after John Thomas died. His battalion took part in the attack and lost another 250 men and two officers. Meanwhile at home in Monk Bretton the family had suffered another tragedy, Nellie Jobling, John Thomas’s three year old niece had suffered fatal burns whilst playing with matches in January 1915. 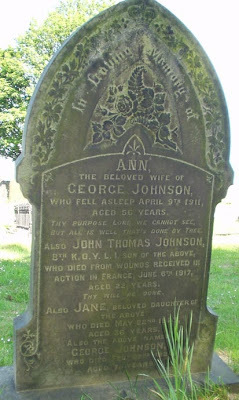 It was reported in the Barnsley Chronicle that her mother, John Thomas’s sister Ellen, had been upstairs with her poorly five year old sister at the time. Nellie is also buried in Monk Bretton cemetery, in an unmarked plot adjacent to the Johnson grave. I have not yet found any evidence that any of John Thomas’s brothers also served in the war, but as so many of the World War One records were destroyed in the blitz in the Second World War this is not unusual. In my recently compiled list of WW1 prisoners of war I have found a George Henry Lane from Day's Croft who was interned in Holland, but no mention of any absent Johnson men. We can only hope that the rest of the family came through unscathed. The inscription on a stone in Monk Bretton cemetery is a poignant reminder of those many thousands of men who left their homes never to return. The rain has turned to a thunderstorm with accompanying heavy rain, very good for the garden and cooling us all down a little I hope. The cat has retreated to the spare bedroom and hopefully after I've checked this I will also return to my bed.